How Smudge Came, written by Nan Gregory and illustrated by Ron, has been published in a Chinese edition by Foreign Language Teaching and Research Press. the leading educational publisher in China. How Smudge Came was first published in 1995 by Red Deer College Press. It has since been published in US, Australian, Danish, Japanese and German editions with sales of over 300,000 copies. Here is a gallery of Ron’s paintings on the theme of Remembrance Day and Veterans Day. Ron talks about his early artistic influences and creations, plus Roll On: Rick Hansen Wheels Around the World, Juba This, Juba That and more in the November/December 2012 issue of Canadian Teacher Magazine. “BOO!” by Ron Lightburn. Acrylic on canvasboard. Tomorrow, October 31 from 10:00 am – 2:00 pm, we will be celebrating Halloween at the Kentville Farmer’s Market! We will be signing and selling Pumpkin People books, greeting cards and original paintings, so there will be something for everybody and every budget. Stop by our table to say “Trick or Treat” and receive a free Pumpkin People bookmark! Ron presented copies of his new book Roll On: Rick Hansen Wheels Around the World at Glooscap Elementary School to Hannah and Josie Corkum and principal Corena Burbidge. When Ron was working on the illustrations for the book last year he met twin sisters Hannah and Josie who were students at the school. With permission from their mother Shelley they agreed to pose as characters in the book. One of the scenes takes place in Florida where Rick meets two friends named Beth and Sandy. Ron changed Josie’s hair colour to red and gave her a pony tail for the illustration of Beth. Shelley helped too by sitting in for Rick in the reference photo. For another illustration Hannah and Josie posed as two boys who meet Rick when he is in New Zealand. Also Josie posed as a blind girl for a scene in Poland. They did a great job and were a big help to Ron in the creation of Roll On. Way to go, Hannah and Josie! New exit signs for the town of Berwick, Nova Scotia were installed today on Highway 101. The image for these signs is a collaboration between Ron and Wolfville designer Steve Slipp. Ron created a preliminary acrylic painting for the illustration which was enlarged and recreated using reflective vinyl. This is Ron’s third Nova Scotia highway sign illustration. He also created paintings for Mabel and Alexander Graham Bell Way in Cape Breton and the William Hall VC Memorial Highway in Hantsport. 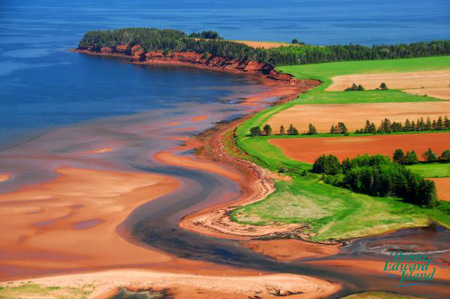 It’s official… Ron has been selected to tour Prince Edward Island for TD Canadian Children’s Book Week in 2013! The tour will take place from Saturday, May 4 to Saturday, May 11, 2013. Thirty English-speaking authors, illustrators and storytellers will be visiting schools, libraries, bookstores and community centres in every province and territory across the country. The Book Week tour participants will travel to the shores of Newfoundland and Labrador, across the Prairies, through the mountains of British Columbia and up to the very tips of Nunavut, the Northwest Territories and the Yukon. They will visit schools, libraries, community centres and bookstores in every province and territory and speak to their audiences about the pleasures of reading, writing and illustrating books for children and teens. TD Canadian Children’s Book Week is the single most important national event celebrating Canadian children’s books and the importance of reading. Close to 35,000 children, teens and adults participate in activities held in every province and territory across the country. Hundreds of schools, public libraries, bookstores and community centres host events as part of this major literary festival. We attended the opening of the Harvest Festival this morning at Centre Square in Kentville. Spike was there too, of course, in the middle of the action! Spike’s favourite activities are dancing and posing for photos. Here he is with the Apple Blossom Queen and princesses, plus local Girl Guides (and a giant chocolate mint cookie). The Pumpkin People theme this year is characters from animated movies, “Lights, Camera, Pumpkins!”. Sandra had a chat with Mike from Monsters Inc.
We were interviewed for the October, 2012 issue of Apple Valley Scoop Magazine. This free publication is distributed to over 43,000 homes throughout the Annapolis Valley of Nova Scotia. We discuss Pumpkin People, Roll On: Rick Hansen Wheels Around the World, StoryWalk, Margo’s Place and much more! See the feature story on pages 22-23. Today we visited Kings County Academy (KCA) in Kentville, NS for the fifth annual Pumpkin People reading and book give away. Every year since 2008 Kentville Mayor Dave Corkum has teamed up with us to give a reading of our book to all of the Grade 3 students at the school. Mayor Dave reads the text while we turn the pages of a giant version of the book for all to see. Following the reading today we were joined by Spike, the Kentville town mascot who is also a character in Pumpkin People. Mayor Dave handed out a free copy of our book to each student while Spike gave out hugs and high fives to everyone. Spike is happy to pose for class pictures! During the visit Ron presented a copy of his new book Roll On to KCA principal Mike Ouellette for the school library. As Rick Hansen wheels around the globe on his incredible Man in Motion World Tour, the children he meets are encouraged to dream their own dreams and work to make them come true. In China, after meeting Rick, Lin, who longs to be a ballerina, pictures herself leaping gracefully over a wall as high as the Great Wall of China. Back in Canada, Jack makes great progress in his wheelchair — even learning to do a wheelie — as he eagerly awaits his hero’s return. On its twenty-fifth anniversary, Rick Hansen’s compelling journey is retold for young readers and brought to life in this illustrated book. It is a story of triumph, adventure, and enormous personal challenge. Readers travel with Rick, glimpsing not just the joys but all the ups and downs and the aches and pains that he endured on the 43,000-kilometre journey. Readers also discover little-known facts of the great journey. They learn that Rick wheeled the equivalent of three marathons a day and went through ninety-four pairs of gloves. And they learn about the gift of a song that Rick and his team sang or hummed kilometre after kilometre. The text and illustrations combine to bring to life Rick’s amazing feat and the impact it has had on children everywhere. A very nice website; and what beautiful illustrations, you have an amazing talent Ron. I am hoping that sometime in the future I will see a publication in regards to the valley’s annual Apple Blossom Parade/Festival. Keep up the good work, both of you. Thank you for your kind comments, Bonnie. An Apple Blossom Festival book for young readers is on our To Do list! Wondering if you would allow me to use your Remembrance Day painting as a template for a stained glass/paint project? I work as a Life Enrichment Aide at AONS Moira Place in Tweed Ontario, I would love to use your image as a project for our Art Expression Program. additional Industry Centers are open at the identical time.